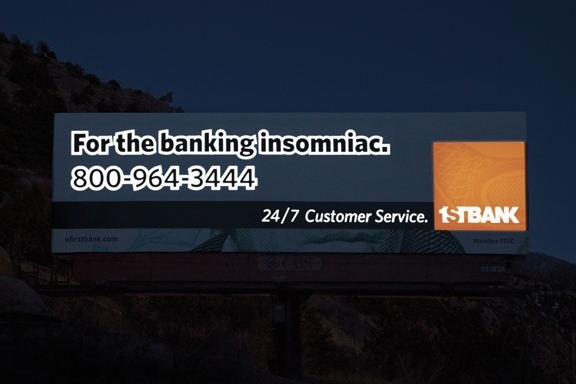 This winter when travelers return to Denver after a day in the mountains, they will see a glow-in-the-dark billboard advertising FirstBank Colorado's 24/7 phone support. It's part of the bank's ongoing "helpfulness" campaign, created by TDA_Boulder, Boulder, Colo. The 14' x 48' billboard uses electro-luminescent vinyl to glow in two colors, a cool green and the bank's signature orange. Placed on I-70, facing eastbound traffic, the board will be visible during the winter's short days. The technology is by Safe Lites. Um, they could have just used an illuminated board. They have those things you know.